It is only and always about the pet family. The root of that philosophy is that cancer, whether it is in a pet or a human, makes an impact far beyond the afflicted individual. Families navigate through the cancer journey together. They cry together. They hope together. We’re in the business of treating cancer. That means we’re in the business of supporting families through one of the most difficult periods they may ever experience. Beyond our clinical capabilities, we preach empathy and compassion throughout our national network of cancer care centers. At the end of the day, however, PetCure Oncology is only as strong as the impact we make on the pet owners we serve. To paraphrase an old football coach, we are who you think we are. As such, there is no greater feedback we can receive than a heartfelt client testimonial. We can sit back and tout our family-centered approach until the cows come home, but it doesn’t mean much unless the pet owners we work with feel it – before, during and after their pet’s cancer treatment. Take Scott and June Phillips, for example. The Chicago residents were devastated when their 12-year-old German Shepherd, Brutus, was diagnosed with a spinal tumor over the summer. In July, Brutus became one of the first patients treated at our newest location, PetCure Oncology at Lakeshore in suburban Milwaukee. I would like the world to know how much my wife and I appreciate the expert professional attention and loving care this team put forth to help us cope and care for our son. Words can and will never express the gratitude we feel and the respect we have for all these individuals who helped Brutus through this difficult time… This is the “A” Team. I promise whoever reads this if you ever need medical attention for a family member with four legs, this is the best place in the United States to be… Thanks again to all involved. Thank you, Scott and June. We greatly appreciate the kind words and sincerely hope they help a future pet family in the same shoes feel more comfortable. More often than not, pet families come to us in a place of hopelessness and uncertainty. One of our primary objectives is to restore each family’s hope. In each and every instance, we strive to provide an objective and comprehensive picture of the pet’s situation. That means setting realistic prognoses and expectations. If you’ve ever been around a human or pet with cancer – as I’m sure most of you have – then you understand it doesn’t always end the way we want it to. 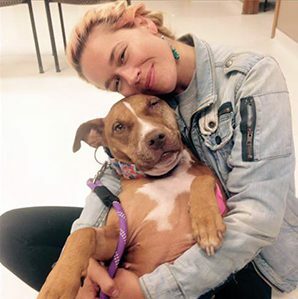 Unfortunately, that was the case for Kelsey Westbrook, a Louisville resident whose playful Pit Bull, Sunny, was treated for an oral tumor at PetCure Oncology at Care Center in Cincinnati. (If you don’t know Sunny’s story, I encourage you to read about her inspiring life.) Kelsey elected to have Sunny treated even though her prognosis was guarded. While SRS bought Kelsey and Sunny some extra time together, we’re sorry to say that Sunny lost her battle with cancer in late May. PetCure Oncology’s Cincinnati location was nothing but sheer kindness, knowledge, and the perfect blend of love and professionalism while my dog, Sunny, received Stereotactic Radiosurgery in February. Kelli Sloane, the radiation therapist, has in particular been integral in helping us get through this process. She takes my calls at any moment, answers questions, coordinates with Dr. Mauldin — who gets back with her in a matter of moments. I can’t imagine having to face my dog’s cancer with any other group of humans. I would encourage ANYONE facing canine or feline cancer to explore PetCure Oncology as an option — particularly SRS — and don’t give up! PetCure will give you all the options possible and speak openly about what they feel they can achieve with their state-of-the-art technology and expertise. Thank you all so much for all you have done for Sunny. While we will miss Sunny very much, we were grateful for the opportunity to aid her fight against cancer. Every case we treat is different, but our commitment to fighting pet cancer and supporting pet families never wavers. If you have had an experience with PetCure Oncology, I encourage you to take a few minutes and share your experience on our Client Testimonial page. Not only will your feedback help us continue to improve every day, but it may very well help a pet family in need. As we have learned, inspiration and hope can go a long way. This personal blog entry was contributed by Ben Chiswick, PetCure Oncology’s Director of Operations and the proud pet parent of Bandit, an 8-year-old Australian Cattle Dog.